How much does it cost to travel to Jodhpur? How much money will you need in Jodhpur? ₨846 ($12) is the average daily price for traveling in Jodhpur. The average price of food for one day is ₨393 ($5.66). The average price of a hotel for a couple is ₨451 ($6.50). Additional pricing is in the table below. These average travel prices have been collected from other travelers to help you plan your own travel budget. How much money do I need for Jodhpur? 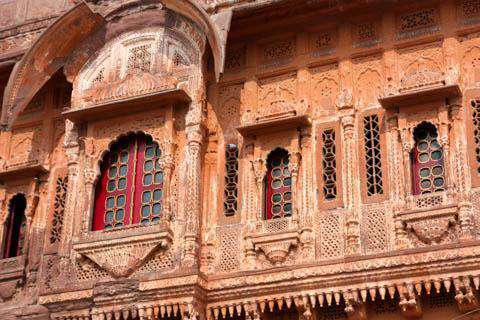 Jodhpur is a city in the Rajasthan state of India. This city is located on the outskirts of the Thar Desert and is known for having sunshine almost every day of the year. Rao Jodha, an ancient Rajput chief, founded the city in 1459 AD. Many of the houses in the city are shades of blue, hence the reason that the city is sometimes referred to as the Blue City. The main sight in Jodhpur is the Mehrangarh Fort. It is the largest fort in the entire state of Rajasthan and was founded back in 1458. The fort sits upon a very tall hill, which is probably the reason that it was never taken by force. Today, it offers beautiful views of the entire city. It is free to get up to fort to see the views, however, there is a small cost if you wish to go inside to see the palace and its museums. Within the palace, you can see many extravagant rooms, halls and temples. For example, Moti Mahal is a hall that is completely pearl colored with glass windows. Sheesh Mahal is a hall made completely of mirrors and Chamunda Mataji Temple is a beautiful temple hidden away within the palace that was once devoted to Rao Jodha's favorite goddess. Just a kilometer down the hill from the Mehrangarh Fort is the Jaswant Thada. These are royal tombs made of marble that sit on a lake. The lake is completely waste free as well, making it a very picturesque sight. The Umaid Bhawan Palace, which was only completed in 1944, is another beautiful sight. Half of this building has been made into a five-star hotel, while the other half is where the Maharaja of Jodhpur lives. For a small fee, you can go inside to see the hotel or the museum where there are vintage cars on display. There are also some incredible natural sights in the city; Balsamand Lake, Kailana Lake, and Gulab Sagar Lake are a few. Temples are plentiful in the city as well; Baba Ramdev Temple, Pal Balaji Temple, and Ganesh Temple are just a few that can be found within the city. While visiting the Mehrangarh Fort, you can go on a zip line tour above the Chokelao Gardens that are within the fort. The company that runs this activity is called Flying Fox. Another activity that takes place at the Mehrangarh Fort is the Rajasthan International Folk Festival, which takes place every year during October. A cultural activity to take part in is taking a tour of one of the Bishnoi villages. The men and women are in traditional clothing are very open to interacting with the visitors of their village. You can also set up a tour through the countryside after visiting the village, where you are bound to see herds of black buck running freely. There are not many restaurants in the town of Jodhpur, the only place you can really find them are near the Mehrangarh Fort (the tourist area). Outside of this area, you will mostly only find street carts that sell traditional food. There are many delicacies in Jodhpur that you should try while visiting. Makhaniya Lassi is a type of drink made from yogurt that has cardamom and butter in it. Dal Bati Churma is a meal that includes bread that is dipped into a curry. Kaju Draksh ki Sabji is a curry that is made with cashews and raisins. For sweet treats try Mawa Kachori, Doodh Jalebi, or Malai Kulfi. Jodhpur is easily reachable by air, railway, or road. There is an airport about five kilometers outside of town that connects to Dehli and Mumbai. The India Rail Network has trains that frequently travel to and from Jodhpur. A common route is the Mandor Express, which leaves Dehli at eight in the evening and arrives in Jodhpur at eight the next morning. Once you are in the city, the best way to get around is either by taxi, bus, or rickshaws. Taxis charge by distance traveled, the only taxi company in the city is called Suncity Cabs. The buses in town are available, however, they can sometimes be quite chaotic. Rickshaws are the most common means of transport in the city, and they require that you negotiate a fare with your driver before getting on board. There are many places just outside of the city that are perfect for day trips. Osiyan is about sixty kilometers outside of town where you can see many ancient temples or embark on a camel safari. Jaisalmer is another town nearby, situated near the Pakistan border that is known as the "golden city". It is named this because of the fort that dominates the city's skyline. There are buses that run between Jodhpur and Jaisalmer every hour all day. Some other nearby cities are Udaipur, the city of lakes, and Jaipur, the pink city.